Today, I would like to welcome the newest member to the RustyBrick Team, Matt Ripston. You are thinking, we already have a Matt as part of the team - true, we do. So one of our guys came up with the clever idea to call this Matt, iMatt. iMatt is our first developer hired solely for the purpose of iPhone development. 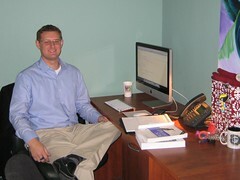 He does have CSS & PHP skills, but his core job task will be to focus on building out iPhone apps and other mobile apps. Matt has been building iPhone apps since about the time the iPhone SDK came out and he has tremendous experience in this area. He has built over eight apps, three of those being games, including Block Busting Planet Panic (links to iTunes). Some are you are asking, did we find iMatt via our iPhone recruiting app? The answer is no. Matt is local, we found him through a trusted recruiter. Matt received a B.S. in Computer Science from Ramapo University and is currently pursuing an MBA through Indiana University.